London, UK – Legendary artist Roger Dean is the latest celebrity to be added to the line-up for Rick Wakeman’s WAKEmanFEST in October 2015 in Lincolnshire. Roger will be holding a Question & Answer session on Saturday October 31st at 3:40pm – 4:00pm, as well as showcasing his spectacular art. Known primarily for the dreamy, other-worldly scenes Roger Dean has created for Yes, Budgie, Uriah Heep, Gentle Giant and other bands, Dean has said, “I don’t really think of myself as a fantasy artist but as a landscape painter.” His first album cover work was in 1968 for The Gun. He also did the artwork for Atomic Rooster’s album In Hearing of… This album cover hinted at the inimitable style for which he would later become famous. In the same year Dean produced the cover for the first album by the African/Caribbean band Osibisa, which featured a hybrid insect/elephant. This was much closer to Dean’s work as we came to know it and it attracted widespread attention. Later that year, he began the partnership with the progressive rock bands Yes (and Asia) for which he is best known. His first design for Yes was for their album Fragile. Dean designed the now-classic Yes “bubble” logo, which first appeared on the album Close to the Edge, and continued to create covers for the band. In addition to their album covers, Dean also contributed to his brother Martyn Dean’s stage set designs for the band. Though he primarily works with watercolour paints, many of his paintings make use of multiple media, including gouache, ink, enamel, crayon and collage. In addition to his cover paintings, Dean is respected for his calligraphic work, designing logos and titles to go with his paintings. There are three books chronicling Roger Dean’s art: “Views” (1975) “Magnetic Storm” (1984) “Dragons Dream” (2008). The event will be held at the legendary Boston Gliderdrome in Lincolnshire. The venue started life as a roller skating rink, but began to attract musical acts in the 1950’s. The venue’s golden age came after it was rebuilt in 1964 following a fire. The rink remained but the Starlight Rooms opened and the biggest names in pop headed to the east of England, which includes Yes, The Kinks, Small Faces, Elton John, T.Rex and Jimi Hendrix to name a few. 6:30pm – 7:00pm – Q&A with The 3 (or possibly 4) Wakeman’s. 7:30 – 8:15pm – The Cadbury Sisters. 9:00 – 11:00pm – Wakeman Cubed. 5.30pm – 6.00pm – Q&A with The Electric Strawbs. During lunch – Three games people for people to play with all proceeds to the Grand Order of Water Rats plus an auction. 2:35pm – 3:00pm – Magician ! 4:00pm – 5:00pm – Rick Wakeman & The English Rock Ensemble – Chrissie Hammond also making a guest appearance. 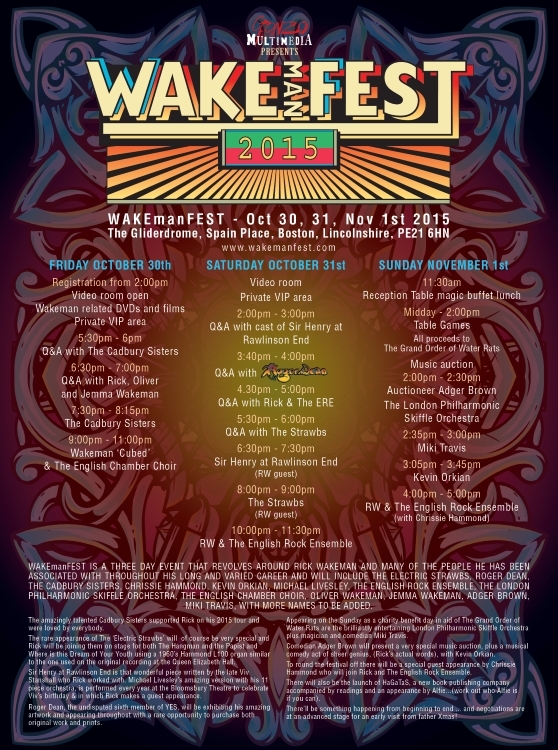 Keyboard Legend Rick Wakeman Presents WAKEmanFest 3-Day Event October 30-November 1, 2015! London, UK – WAKEmanFEST is the brainchild of Rob Ayling from Gonzo Multimedia and was conceived as a three day event that would revolve around people Rick Wakeman has worked with spanning over 40 years in the music industry and his own band, The English Rock Ensemble. The festival will run Friday 30th October, Saturday 31st October and Sunday 1st November. 2:00pm – 3:00pm – Q&A with cast of Sir Henry of Rawlinson’s End. Says Rick, “The Cadbury Sisters supported me on my last tour and were absolutely amazing. Everybody simply loved them. “The Electric Strawbs of course will be very special as I will be joining them for 2 pieces. The Hangman and the Papist and also Where is this Dream of our Youth…and I will be using an original Hammond L100 similar to the one I used on the original recording at the Queen Elizabeth Hall. “Sir Henry of Rawlinson’s End is that wonderful piece written by the late Viv Stanshall who I worked with. Mike Livesley does an amazing version which I join in with every year at the Bloomsbury Theatre. His entire 11 piece band (plus me) will be performing it. “Kevin Orkian is a music and comedy genius and also a Water Rat, hence his appearance which is not to be missed!